For most of its history, Royal Mail has been a public service, operating as a government department or public corporation. However, following the Postal Services Act 2011, a majority of the shares in Royal Mail were floated on the London Stock Exchange in 2013. The UK government initially retained a 30% stake in Royal Mail, but sold its remaining shares in 2015, ending 503 years of public ownership. It is a constituent of the FTSE 250 Index. As of 13 January 2019[update], Royal Mail share value is at an all time low. 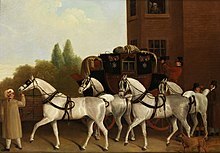 The first mail coach ran in 1784, operating between Bristol and London. Delivery staff received uniforms for the first time in 1793, and the Post Office Investigation Branch was established. The first mail train ran in 1830, on the Liverpool and Manchester Railway. 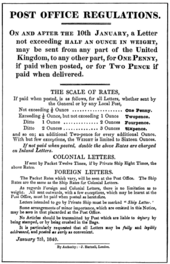 The Post Office's money order system was introduced in 1838. The first Post Office pillar box was erected in 1852 in Jersey. Pillar boxes were introduced in mainland Britain the following year. British pillar boxes traditionally carry the Latin initials of the reigning monarch at the time of their installation, for example: VR for Victoria Regina or GR for Georgius Rex. Such branding is not used in Scotland due to dispute over the current monarch's title. Some Scottish nationalists argue that Queen Elizabeth II should have simply been Queen Elizabeth as there had been no previous Queen Elizabeth of Scotland or of the United Kingdom of Great Britain and Northern Ireland (Elizabeth I was Queen only of the pre-1707 Kingdom of England). The dispute included vandalism and attacks on pillar and post boxes introduced in Scotland that displayed EIIR. To avoid the dispute, pillar boxes in Scotland were either marked 'Post Office' or use the Scots Crown. British Telecom was separated from the Post Office Corporation in 1980 and demerged as an independent business in 1981. Girobank was sold to Alliance & Leicester in 1990 and Royal Mail Parcels was rebranded as Parcelforce. The remaining business continued under public ownership as privatisation of this was deemed to be too unpopular. However, in the 1990s President of the Board of Trade Michael Heseltine began investigating a possible sale and eventually a Green Paper on Postal Reform was published in May 1994, outlining various options for privatisation. The ideas though, proved controversial and were dropped from the 1994 Queen's Speech after a number of Conservative MPs warned Heseltine they would not vote for the legislation. In 1999 Royal Mail launched a short-lived e-commerce venture, ViaCode Limited, aimed at providing encrypted online communications services. However it failed to make a profit and closed in 2002. In 2004, the second daily delivery was scrapped in an effort to reduce costs and improve efficiency, meaning a later single delivery would be made. That year, the travelling post office mail trains were also axed. The following year Royal Mail signed a contract with GB Railfreight to operate an overnight rail service between London and Scotland (carrying bulk mail, and without any on-train sorting); this was later followed by a London-Newcastle service. Royal Mail's chief executive Moya Greene publicly supported Cable, stating that the sale would provide staff with "a meaningful stake in the company", while the public will be able to "invest in a great British institution". On 12 September 2013, a six-week plan for the sale of at least half of the business was released to the public; the Communication Workers Union (CWU), representing over 100,000 Royal Mail employees, said that 96% of Royal Mail staff opposed the sell-off. A postal staff ballot in relation to a nationwide strike action was expected to take place in late September 2013. The CWU confirmed on 13 October 2013 that strike action would occur in response to the privatisation of Royal Mail, with a possible start date of 23 October 2013. A union source stated: "It is likely to be an all-out strike first, then rolling strikes in the run up to Christmas", while the CWU had dismissed the offer of an 8.6% rise over three years as "misleading and unacceptable". Prior to the announcement of the strike ballot results on the afternoon of 16 October 2013, employees were offered £300 to cross the picket line if a nationwide postal strike occurs. The CWU called off strike action on 30 October 2013 while negotiations progressed with Royal Mail's management. The talks were extended on 13 November 2013, with the aim that an agreement be reached by both sides by 20 November 2013. Royal Mail confirmed that both sides had reached a proposed settlement on 4 December, and the CWU confirmed on 9 December 2013 that it would recommend the deal to its members. On 6 February 2014, the CWU confirmed that Royal Mail staff had voted to accept the settlement. Royal Mail's "Door to door" service provides delivery of leaflets, brochures, catalogues and other print materials to groups of domestic and business addresses selected by postcode. Such deliveries are made by the mail carrier together as part of the daily round. Companies using the "Door to door" service include Virgin Media, BT, Sky, Talk Talk, Farmfoods, Domino's Pizza, Direct Line and Morrisons. In 2005 the service delivered 3.3 billion items. The "Door to door" service does not use the UK Mailing Preference Service – instead, Royal Mail operates its own opt-out database. Warnings about missing government communications given by Royal Mail to customers opting out of their service have been criticized by customers and consumer groups. Clarification given by the company in June 2015 explained that election communications and unaddressed government mail would be delivered to customers even if they had opted out. In July 2012 Ofcom consulted on a scheme proposed by Royal Mail to alter its delivery obligations to allow larger postal items to be left with neighbours rather than returning them to a Royal Mail office to await collection. The scheme was presented as offering consumers greater choice for receiving mail when not at home, that is if Royal Mail deliver items as per their stated contractual obligations and was said to follow Royal Mail research from a 'delivery to neighbour' trial across six areas of the UK that showed widespread consumer satisfaction. In a statement dated 27 September 2012, Ofcom announced it would approve the scheme after noting that more goods were being purchased over the internet and that Royal Mail's competitors were permitted to leave undelivered items with neighbours. People who do not wish to have parcels left with neighbours, or to receive those of others, can opt out by displaying a free opt-out sticker near their letterbox. Royal Mail remains liable for undeliverable items until they are received by the addressee or returned to sender. Royal Mail operates a network of 38 mail centres. Each mail centre serves a large geographically defined area of the UK and together they form the backbone network of the mail distribution operation. Mail is collected and brought to one of the mail centres. Mail is exchanged between the mail centres and then forwarded to one of 1,356 delivery offices, from where the final delivery is made or a P739 card is left. As part of the sorting process, mail is collected from pillar boxes, Post Office branches and businesses, and brought to the local mail centre. The process is divided into two parts. The 'outward' sorting identifies mail for delivery in the mail centre geographic area, which is retained, and mail intended for other mail centres, which is dispatched. The 'inward' sorting forwards mail received from other centres to the relevant delivery offices within the mail centre area. The number of mail centres has been declining as part of the Mail Centre Rationalisation Programme. In 2008, there were 69 mail centres and in 2010 there were 64. It was anticipated that around half of these could be closed by 2016. Oldham and Stockport along with Oxford and Reading mail centres all closed in 2009 and Bolton, Crewe, Liverpool, Northampton, Coventry and Milton Keynes were closed in 2010. Farnborough, Watford and Stevenage were closed in 2011. Hemel Hempstead, Southend, Worcester were closed in 2012. Dartford, Tonbridge, Maidstone and Canterbury were closed in 2012 but replaced by a new mail centre in Rochester. The East London and South London mail centres were closed during summer 2012. In 2013 and 2014, a further eight mail centres were planned to be closed. The old mail centres in Northampton, Coventry and Milton Keynes were replaced with the new South Midlands mail centre in Northampton covering Warwickshire, Coventry, Northamptonshire and Milton Keynes. The South Midlands Mail Centre is the largest in the UK. In addition to running a large number of road vehicles, Royal Mail uses trains, a ship and some aircraft, with an air hub at East Midlands Airport. Dedicated night mail flights are operated by Titan Airways for Royal Mail between East Midlands Airport and Bournemouth Airport and between Exeter International Airport and London Stansted Airport. One Boeing 737-3Y0 was flown in full Royal Mail livery. In June 2013, Royal Mail confirmed it would extend Titan Airways' contract to operate night flights from Stansted Airport, from January 2014 to January 2017, introducing new routes to Edinburgh and Belfast using three Boeing 737s. The new contract called for the replacement of the British Aerospace 146-200QC (Quick Change) aircraft in favour of a standard Boeing 737 fleet, and the type was withdrawn by Titan Airways in November 2013. The RMS St. Helena is a cargo and passenger ship that served the British overseas territory of Saint Helena. It sailed between Cape Town, Saint Helena and Ascension Island. It was one of only two Royal Mail Ships in service, alongside the Queen Mary 2, although it did not belong to Royal Mail Group. ^ "Royal Mail Group Board". Royal Mail. Retrieved 7 June 2018. ^ a b c d "Annual Report 2018" (PDF). Royal Mail. Retrieved 20 March 2019. ^ "1st Class mail". Royal Mail. 2013. Retrieved 15 October 2013. ^ a b "Royal Mail privatisation bill unveiled by Vince Cable". BBC News Online. British Broadcasting Corporation. 13 October 2010. Archived from the original on 16 February 2019. Retrieved 25 May 2011. ^ "Postal Services Bill 2010–11". Parliament UK. Retrieved 25 May 2011. ^ "Royal Mail Rise 'As Expected', Say Ministers". Sky News. 25 November 2013. Retrieved 11 February 2014. ^ a b "Royal Mail: Final stake sale raises £591m". BBC News. 13 October 2015. Retrieved 15 October 2015. ^ "A brief timeline of the Royal Mail". Archived from the original on 6 August 2014. Retrieved 1 August 2014. ^ "Twitter's float reminds us why we must privatise the Royal Mail". City.am. 13 September 2013. Retrieved 15 October 2013. ^ Lewins, W (1865). Her Majesty's Mail. London: Sampson, London. p. 38. Hamilton, John Andrew (1893). "Prideaux, Sir Edmund". In Lee, Sidney (ed.). Dictionary of National Biography. 36. London: Smith, Elder & Co. pp. 350, 351. ^ a b How, James S. (2003). Epistolary spaces: English letter-writing from the foundation of the Post Office to Richardson's Clarissa (illustrated ed.). Ashgate Publishing, Ltd. pp. 11, 12. ISBN 978-0-7546-0354-2. ^ Great Britain. Parliament. House of Commons (1844). "Documents relating to the Office of Postmaster, &c., delivered in by Mr. Reeve, from the Council-office, &c. – From the register of the Council of State". House of Commons papers. 14. HMSO. p. 28. ^ "British Stamps". Retrieved 15 October 2013. ^ Allan, Marshall (2003). Intelligence and Espionage in the Reign of Charles II, 1660–1685. Cambridge, UK: Cambridge University Press. p. 79. ISBN 0-521-43180-8. ^ Smith, D. J. (2004). Discovering horse-drawn vehicles. Princes Risborough: Shire Publications. p. 52. ISBN 0-7478-0208-4. ^ "Post Office Money Order: A. Scott of Bootle to Peter Hodgson Esq, Whitehaven, 1841". Victorian Web. Retrieved 15 October 2013. ^ Hill, Rowland (1840). "On the Effect of the New Postal Arrangements upon the Number of Letters". Journal of the Statistical Society of London. London: Statistical Society (Great Britain). 3: 102. Retrieved 23 November 2009. ^ Third Report of the Postmaster General on the Post Office. London: HMSO. 1857. p. 41. ^ a b Osmańczyk, Edmund Jan; Mango, Anthony (2003). Encyclopedia of the United Nations and International Agreements: Third Edition Volume: N to S. Taylor & Francis. p. 2179. ^ "Mulready stationery: Lettersheets and envelopes". The Queen's Own: Stamps That Changed the World. National Postal Museum. Retrieved 25 September 2006. ^ Petersen, Bruce (16 May 2006). "Philately: Countries: Great Britain". National Postal Museum. Retrieved 3 September 2012. ^ "Murray's Handbook to London As It Is". Victorian London – Communications – Post – Delivery Times and Postal Regulations. 1879. Retrieved 3 December 2008. ^ "Telegram messengers". Retrieved 15 October 2013. ^ "Timeline of key events". Postal Heritage. Retrieved 15 October 2013. ^ Lister, Graham. Many Changeful Years. p. 177. Retrieved 15 October 2013. ^ "Airgraph". Retrieved 15 October 2013. ^ "40th Anniversary of the Post Office Act 1969". The British Postal Museum & Archive. 5 October 2009. Retrieved 20 June 2011. ^ "GIRO". National Archives. Retrieved 15 October 2013. ^ "1971: "Post strike ends with pay deal" (bbc.co.uk)". BBC News. 30 October 1970. Retrieved 12 September 2010. ^ "Modern postcodes are 50 years old". BBC. 2 October 2009. Retrieved 15 October 2013. ^ "Romec Cleaning Services Investigation uncovers Endemic Safety failures". CWU. 28 August 2006. Archived from the original on 4 November 2013. Retrieved 15 October 2013. ^ "Tory rebels thwart Royal Mail sell-off". Independent. 3 November 1994. Retrieved 23 June 2011. ^ "Legislation concerning the Royal Mail company". National Archives. 2009. Archived from the original on 3 July 2009. Retrieved 26 August 2013. ^ "UK Post Office name change". BBC News. 9 January 2001. Retrieved 26 August 2013. ^ Fagan, Mary (9 June 2002). "Consignia name lost in post as Royal Mail returns". The Telegraph. Retrieved 26 August 2013. ^ "Sci/Tech: Royal Mail posts e-commerce first". BBC. Retrieved 17 March 2018. ^ "Royal Mail pulls plug on ViaCode digital certificate". The Register. 29 May 2002. Retrieved 17 March 2018. ^ "Where do missing letters go?". BBC News. 20 March 2001. Retrieved 26 August 2013. ^ "Second post to be ditched". BBC News. 26 February 2002. Retrieved 26 August 2013. ^ "End of line for mail trains". BBC News. 10 January 2004. Retrieved 13 May 2009. ^ Blake, Heidi (10 June 2010). "The Royal Mail: a history of the British postal service". The Daily Telegraph. Retrieved 2 October 2013. ^ "Royal Mail loses postal monopoly". BBC News. 18 February 2005. Retrieved 17 April 2010. ^ "Online postage service launched". BBC News. 19 September 2006. Retrieved 26 August 2013. ^ "Sunday postal collections ended". BBC News. 27 October 2007. Retrieved 13 May 2009. ^ "Merged consumer body begins work". BBC News. 1 October 2008. Retrieved 26 August 2013. ^ Sparrow, Andrew (5 May 2009). "Brown will back down over Royal Mail privatisation, predicts Labour rebel". The Guardian. ^ "Royal Mail names Moya Greene as new chief executive". BBC News. 27 May 2010. Retrieved 27 May 2010. ^ King, Ian; Lindsay, Robert (27 May 2010). "Moya Greene of Canada Post in line for top job at Royal Mail". The Times. London. Retrieved 27 May 2010. ^ Waples, Mark (6 September 2010). "Changes to the Inland Letter Post and Inland Parcel Post Schemes" (PDF). Royal Mail. Retrieved 18 November 2013. ^ "The Establishment of an Internal Postal Market". Europa (web portal). 7 February 1994. Retrieved 7 June 2015. ^ "TNT Post UK Limited: Response to Consultation End-to-end competition in the postal sector: Draft guidance on Ofcom's approach" (PDF). Ofcom. 8 January 2013. Retrieved 7 June 2015. ^ Hilton, Adrian (12 July 2013). "Royal Mail Privatisation: The prospect of the Queen's head juxtaposed with Virgin ought to offend all who care about her dignity". Daily Mail. Retrieved 7 June 2015. ^ "Postal Services Act 2011". Legislation.gov.uk. 13 June 2011. Retrieved 23 June 2011. ^ "Securing the Universal Postal Service – Decision on the new regulatory framework". Ofcom. 27 March 2012. Retrieved 4 April 2012. ^ "Ensuring the future of the universal postal service and Post Office network services". Gov.uk. 10 July 2012. Retrieved 26 August 2013. ^ Hope, Christopher (24 January 2012). "Fear of mass post office closures averted as Royal Mail agrees 10-year lifeline". The Daily Telegraph. London. ^ a b Jennifer Rankin (10 July 2013). "Royal Mail privatisation will not affect postal delivery – Vince Cable". The Guardian. Retrieved 11 July 2013. ^ Neate, Rupert (12 September 2013). "Royal Mail staff set to strike after ministers unveil plans for £3bn sell-off". The Guardian. Retrieved 13 September 2013. ^ Peston, Robert (27 September 2013). "Royal Mail sold today". BBC News. Retrieved 1 October 2013. ^ "Royal Mail shares to be sold before possible strikes". BBC News. 27 October 2013. Retrieved 1 October 2013. ^ Rupert Neate (10 October 2013). "Royal Mail sale: 700,000 apply for shares". The Guardian. Retrieved 10 October 2013. ^ a b "Royal Mail shares jump sharply on market debut". BBC News. 11 October 2013. Retrieved 11 October 2013. ^ "Privatisation of Royal Mail plc" (PDF). Retrieved 11 February 2014. ^ "Royal Mail to deliver IPO in 2013". Financial Times. 25 March 2012. Retrieved 4 April 2012. ^ Neate, Rupert (13 October 2013). "Postal workers push ahead with strike plans over pay and conditions". The Guardian. Retrieved 14 October 2013. ^ Rupert Neate (15 October 2013). "Royal Mail offers £300 to postal workers to cross picket lines". The Guardian. Retrieved 16 October 2013. ^ Topham, Gwyn (30 October 2013). "Royal Mail workers call off one-day strike after talks progress". The Guardian. Retrieved 18 November 2013. ^ Maidment, Neil (13 November 2013). "Royal Mail and CWU extend deadline for pay agreement". Reuters. Retrieved 18 November 2013. ^ "Royal Mail and Communication Workers Union 'reach deal'". BBC News. 4 December 2013. Retrieved 16 December 2013. ^ "Royal Mail workers' union backs a 'landmark' deal". BBC News. 9 December 2013. Retrieved 16 December 2013. ^ "Royal Mail staff accept 'ground-breaking' pay deal". BBC News. ^ a b "Vince Cable defends Royal Mail sale price to MPs". BBC News. 29 April 2014. Retrieved 13 July 2014. ^ a b "Royal Mail Privatisation – Business, Innovation and Skills Committee Contents". Parliament of the United Kingdom. 11 July 2014. Retrieved 13 July 2014. ^ "Taxpayers lost out on Royal Mail sale, says BIS Committee". Parliament of the United Kingdom. 11 July 2014. Retrieved 13 July 2014. ^ Sean Farrell (11 July 2014). "Royal Mail sale underpriced by £1bn, says scathing select committee report". The Guardian. Retrieved 13 July 2014. ^ "Postal Services Across London". London.gov.uk. 16 July 2014. Archived from the original on 3 July 2015. Retrieved 7 June 2015. ^ Conrad Landin (18 July 2014). "London Assembly calls for Royal Mail renationalisation". Morning Star. Retrieved 7 June 2015. ^ "George Osborne announces Royal Mail stake sale". BBC News. Retrieved 6 June 2015. ^ "Government sells 15% of Royal Mail at £5 a share". Guardian. 11 June 2015. Retrieved 15 October 2015. ^ "Royal Mail Postal Guide". PPPGuide. Retrieved 15 March 2015. ^ "Universal Service Obligation". Royal Mail Group. 2013. Retrieved 26 August 2013. ^ "Royal Mail Special Delivery" (PDF). Retrieved 15 October 2013. ^ "Franking services". Royal Mail. 2013. Retrieved 15 October 2013. ^ "Royal Mail Mailmark®". royalmail.com. Retrieved 1 June 2017. ^ "Mailmark Prices". frankedmail.co.uk. Retrieved 1 June 2017. ^ "Royal Mail – Royal Mail Group Ltd". royalmail.com. Archived from the original on 11 June 2011. Retrieved 21 March 2015. ^ "Prohibited goods". Royal Mail. Retrieved 25 January 2015. ^ "Consultation on proposal to prohibit the carriage of firearms" (PDF). Postcomm. Retrieved 11 January 2013. ^ "Carriage of firearms: a decision document" (PDF). Postcomm. Retrieved 11 January 2013. ^ Proposals to prohibit Firearms and component parts from postal services offered under Postal Schemes. Royal Mail. 15 August 2012. ^ "Royal Mail – good news for airgunners and the trade". BASC. Archived from the original on 16 January 2013. Retrieved 11 January 2013. ^ "Door to Door - Leaflet Distribution Service". www.royalmail.com. ^ a b "Door-to-Door Opt-Out". stopjunkmail.org.uk. 9 December 2015. Retrieved 30 June 2017. ^ a b "Anger over Royal Mail's junk mail warning". Evening Standard. 29 August 2006. ^ "How do I opt out of receiving any leaflets or unaddressed promotional material?". personal.help.royalmail.com. 2016. Retrieved 30 June 2017. ^ "Royal Mail workers to get free shares in planned sale". BBC News. 10 July 2013. Retrieved 26 August 2013. ^ 110,000 seek Christmas post jobs, Wales Online, 16 November 2011 (published in Western Mail 17 November 2011). Retrieved 24 November 2011. ^ "Royal Mail Christmas temporary staff complain of lack of pay | Recruiter". www.recruiter.co.uk. ^ D'Arcy, Scott (2 January 2012). "Unpaid Christmas temps hit out at Royal Mail". Swindon Advertiser. Retrieved 2 October 2013. ^ "Britain's Postal Strike Ends With a Settlement". The New York Times. 13 September 1988. Retrieved 2 October 2013. ^ "Wildcats return with a roar – postal wildcat strike, 2003". libcom.org. 10 November 2006. Retrieved 12 September 2010. ^ Mark Tran and agencies (9 October 2007). "Crozier hits out at striking postal workers". The Guardian. London. Retrieved 11 November 2007. ^ "Mail deliveries 'still delayed'". London News. BBC News. 9 November 2007. Retrieved 14 December 2008. ^ "Christmas post fears over strike". BBC News. 15 December 2008. Retrieved 15 December 2008. ^ "Postal workers' strike called off". BBC News. 18 December 2008. Retrieved 2 October 2013. ^ Hope, Christopher; Wallop, Harry (17 September 2009). "Royal Mail strike already 'national' as one in eight letters fail to arrive". The Daily Telegraph. Retrieved 17 April 2010. ^ "Postal workers vote on strike". BBC News. 17 September 2009. Retrieved 12 September 2010. ^ Sturcke, James (8 October 2009). "Royal Mail workers vote for nationwide postal strike". The Guardian. Retrieved 18 November 2013. ^ "Re-opening the post:Postcomm and the quality of mail services". National Audit Office. 22 March 2006. Retrieved 2 October 2013. ^ Jones, Alan (10 February 2006). "Royal Mail fined £11.7m over missing post". The Independent. Retrieved 23 October 2009. ^ Wardrop, Murray (18 July 2011). "Complaints to Royal Mail over 'lost' letters rise by more than a third". The Telegraph. Retrieved 26 August 2013. ^ "Ofcom consults on Royal Mail's 'delivery to neighbour' scheme". Ofcom. Archived from the original on 27 December 2012. Retrieved 12 January 2013. ^ "Royal Mail – roll out of Delivery to Neighbour scheme – Statement". Ofcom. Retrieved 12 January 2013. ^ "Ofcom allows Royal Mail's 'delivery to neighbour' scheme". Ofcom. Archived from the original on 23 December 2012. Retrieved 12 January 2013. ^ Hall, James (17 October 2012). "First and second class post could be scrapped, consultation suggests". The Telegraph. Retrieved 26 August 2013. ^ a b "The Communications Market 2012" (PDF). Stakeholders.ofcom.org.uk. Retrieved 21 January 2016. ^ Samuels, Mark (27 February 2004). "Sorted: Royal Mail's wonder hub". Computing. Retrieved 23 January 2018. ^ Mail Technology: Evolution to E-Revolution. John Wiley & Sons. 2001. ISBN 9781860583278. ^ "Integrated Mail Processing". Royal Mail E-learning Guide. Retrieved 23 January 2018. ^ "Intelligent letter sorting machines (ILSMs)". 500 Years of Royal Mail. Royal Mail Group. Retrieved 23 January 2018. ^ "Cost of hi-tech mail office 'out of control'". The Guardian. 21 May 2003. Retrieved 17 March 2018. ^ "Current Mail Centre Addresses" (PDF). Royal Mail. Retrieved 17 March 2018. ^ "The Courier" (PDF). Royal Mail. 1 December 2011. Retrieved 17 March 2018. ^ a b "Hundreds of Royal Mail workers in Northampton could go on strike". www.northamptonchron.co.uk. Retrieved 9 June 2016. ^ "Royal Mail swaps bikes for guns". BBC News. 30 December 2004. Retrieved 1 October 2013. ^ Leach, Ben (23 August 2009). "Royal Mail to phase out cycling postmen". The Telegraph. Retrieved 18 November 2013. ^ "Royal Mail". East Midlands Airport. 2013. Retrieved 18 November 2013. ^ "G-ZAPV". Airliners.net. Retrieved 25 April 2007. ^ "Titan Airways selected to operate Royal Mail's night mail service". 25 June 2013. Retrieved 18 November 2013. ^ "Royal Mail Operation Extension". Titan Airways. 17 June 2013. Retrieved 17 November 2013. ^ "End of the BAe Era". Titan Airways. 18 November 2013. Retrieved 18 November 2013. ^ "Where We Go". Andrew Weir Shipping Ltd. 2013. Retrieved 26 August 2013. ^ Hancock, Simon (19 January 2010). "Life on one of the world's most remote islands". BBC News. Retrieved 12 September 2010. ^ "Final delivery for Mail Rail". This Is Local London. 30 May 2003. Retrieved 5 July 2017. ^ "Sending mail to the Channel Islands and Isle of Man". royalmail.com. Retrieved 21 March 2015.